Hi Linda, Welcome to Café Cala. It’s great to have you visit Café Cala. I loved Stargazing and can’t wait to read Cauldstane. I’ve been making my granny’s shortbread recipe this morning. Would you like tea or coffee with yours? I’ll have coffee with my shortbread please! 1 Where did you get the idea for Cauldstane? 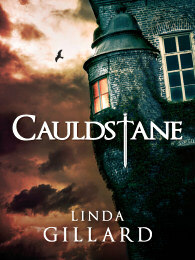 But CAULDSTANE is also a book born of life-threatening illness. It’s a rattling yarn, but it’s also my artistic response to the experience of breast cancer in 2012. I went from diagnosis to mastectomy in less than 3 weeks. I had a very bad time with chemotherapy which, as I write, has left me semi-disabled. Cancer was the biggest thing in my life for almost a year, then fear (of more chemo, worse disability and death) became the biggest thing in my life – until I started writing CAULDSTANE. Working on a new novel gave me a sense of my old self and the nature of the story gave me a channel for examining and expressing my fears. I went public about my cancer on my Facebook author page and many people suggested I should write about my experience, but my attitude was, it was bad enough living it – why would I want to write about it? Nevertheless my experience was so physically and emotionally traumatic, I felt I had to find a way to assimilate it and conquer it. So I decided to write a novel about my experience, but not describing it. But you don’t need to know any of this to enjoy CAULDSTANE, which is a cross between a supernatural thriller and a modern fairy tale. Cauldstane is a decaying 16th century castle in the Highlands where the MacNab family live and it’s a money pit. It’s been the home of the asset-rich, cash-poor MacNabs for generations, but in the 21st century they’re finding it hard to hold on. The family is divided as to whether they should sell up or try to use the castle and estate as the basis of a business. Without a doubt, getting in touch with readers has been the greatest pleasure and reward. I was first published in 2005, but I’m still thrilled to bits when a reader gets in touch or takes the trouble to post a thoughtful review. Over the years I’ve responded to and often corresponded with readers, some of whom have become friends. I love my job and I would write even if no one wanted to read my stories, but the enthusiasm of my readers has given me a massive confidence boost. It seems little short of miraculous to me that such personal and quirky novels should speak to so many different people. I was an over-worked teacher in a very tough school and I cracked up in my 40s. While I was recuperating from a breakdown, I started writing fiction for my own entertainment. I joined an online writing group and members suggested I should try to get an agent for my first novel. 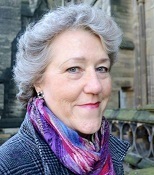 I found an agent who loved my work, but I found my own publisher when I was lucky enough to meet an editor at a writing conference who was looking for manuscripts featuring older women. The romantic heroine of my first novel, EMOTIONAL GEOLOGY was 47, so I told her about the book. She asked to read it and then she decided she wanted to publish it. I was just in the right place at the right time! As a writer? Analytical reading. I was a critical reader long before I was a writer and I think it’s important to make time for reading if you’re a writer. I don’t think it matters what you read – you can learn a lot from bad writing! Watching movies has also helped me understand how stories are constructed. Another thing that’s helped me is a determination to say what I want to say, in the way I want to say it. That led to parting company with my publisher because I wouldn’t re-write HOUSE OF SILENCE as a romance, but by writing just for myself, I avoid being unduly influenced by commercial factors – sales figures, Amazon rankings and reviews, the latest trends in publishing. I just tell the story I want to tell and hope readers will like it. It’s nice if they do, but it’s not the end of the world if they don’t. I consider A LIFETIME BURNING to be my best book, but it’s my least popular. That doesn’t really bother me. I started writing it, my second novel, without any expectation of it ever being published. Fundamentally, I write for myself and I think that might have contributed to my success. I’ve developed an individual “voice”, I believe passionately in what I do and in the quality of my “product”. 5 What advice would you offer aspiring writers? Write for writing’s sake. Don’t expect publication or financial reward – you are very unlikely to get either. Writing is its own reward anyway. When you feel angry about your unsolicited manuscript being rejected, remember: nobody asked you to submit it! If you’re thinking of going indie, write the best book you possibly can and make sure it’s properly edited. Ideally, wait until you have several books ready to e-publish. It’s hard to make an impact with just one. I would also recommend that any would-be indie author joins the international professional body, The Alliance of Independent Authors. http://allianceindependentauthors.org/ They offer advice and support. Their closed Facebook group is a mine of information, generously shared. 6 Which authors do you enjoy reading? In alphabetical order: Margery Allingham, the Brontës, Agatha Christie, Dickens, Daphne du Maurier, Dorothy Dunnett, Penelope Fitzgerald, Margaret Forster, Georgette Heyer, Elizabeth Jane Howard, Susan Howatch, Patrick O’ Brian, Mary Renault, Dorothy L Sayers, Shakespeare, Mary Stewart, Dorothy Whipple, P G Wodehouse. When ghostwriter Jenny Ryan is summoned to the Scottish Highlands by Sholto MacNab – retired adventurer and Laird of Cauldstane Castle – she’s prepared for travellers’ tales, but not the MacNabs’ violent and tragic history. Lust, betrayal and murder have blighted family fortunes for generations, together with an ancient curse. As the MacNabs confide their sins and their secrets, Jenny learns why Cauldstane’s uncertain future divides father and sons. But someone resents Jenny’s presence. Someone thinks she’s getting too close to Alec MacNab – swordsmith, widower and heir to Cauldstane. Someone who will stop at nothing until Jenny has been driven away. Or driven mad. “Hell hath no fury like a woman scorned.” Especially a dead woman. Thanks, Helen. Scotland is my adopted country. I moved there in 2000 after many years holidaying in the Highlands & islands. I’ve lived in some pretty amazing parts of Scotland: the islands of Skye and Arran and I also spent a couple of years in Glasgow. I love Scottish castles – even the ruinous ones. One of my earlier novels, UNTYING THE KNOT is about an ex-soldier who buys a ruined 16thC tower house and converts it into a family home.